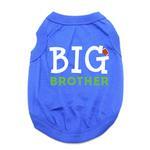 Show off your dog's status and the excitement to be a Big Brother in this fun shirt! The Big Brother Dog Shirt proclaims that your pup is soon to be or already is the "Big Brother" with a fun football. This dog tank top features a sleeveless style with a high-cut, stay-dry belly for the ultimate comfort and convenience. The breathable soft knit is made of 100% cotton. Machine wash, cold and dry flat for best results. 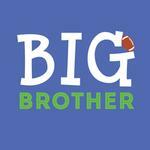 Big Brother Dog Shirt - Blue Customer Photos - Send us your photo! Buddy is checking his "Big Brother" t-shirt out in the mirror. Buddy is a good big brother to Leo... but they play rough sometimes.. :P.
So cute on!! Love this!! Posted On 04/28/17 by Victoria K from Easton, WA Yes, Victoria K recommends this product! Was worried that the shirt wouldn't make it in time for the birth of our hairless , 2 legged family member , got it sooner than expected , so pleased with BaxterBoo once again ! I was very happy with my purchase from Baxter Boo. The products I purchased were excellent and at a reasonable price. Shipping was quick. I will absolutely shop here in the future AND recommend it to friends and associates. Thank you, BaxterBoo.com for the excellent experience!